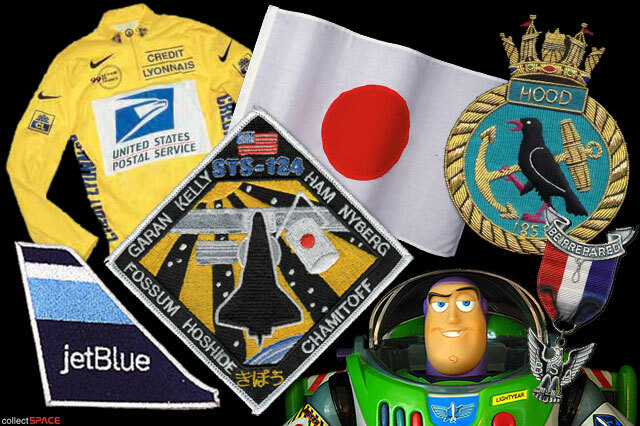 collectSPACE - news - "Astronauts share space through souvenirs"
Examples of patches, pins and more onboard shuttle Discovery. June 4, 2008 — Armstrong and Buzz are in space again, though they aren't the Apollo astronauts who made history walking on the Moon. Rather, cyclist Lance Armstrong and 'space ranger' Buzz Lightyear are sharing space aboard shuttle Discovery, now docked to the International Space Station. And they are not alone; joining them for the 14-day mission are retired Houston Astros' player Craig Biggio and New York Giants' quarterback Eli Manning. Of course, none of the individuals (and fictional character) are themselves in space, but the crew of STS-124 chose to take items representing each of them aboard the orbiter. "Well, he's this super human" said astronaut Karen Nyberg of Lance Armstrong during an interview with collectSPACE before she launched. "I just love his athletic abilities. I am taking one of his [Tour de France] yellow jerseys." Similarly, Manning's back-up Super Bowl XLII jersey and Biggio's last game-worn jersey have places in the orbiting locker room. Four of the crew members hail from the New York/New Jersey area, home to Manning's Giants, and all live, train and take instruction while in space from mission control in Houston, south of the Astros' Minute Maid Park. Lightyear, or a 12-inch action figure-version of the Disney and Pixar "Toy Story" spaceman, will "fly" from Discovery to the space station for a six month stay, kicking off an educational partnership between NASA and the house that Walt built. The stowaways are part of the crew's "personal preference kits" (PPKs), small pouches that hold mementos and not just for celebrities. A majority of the souvenirs are for their friends and family. "Ryan, he has this little bullet that he used to carry around since he was a little kid. I know that sounds terrible but it's a spent rifle bullet and it just means something to him. I don't know why. So, we're flying that," pilot Ken Ham told collectSPACE about one of his two son's items. "And then Randy, he's a big Green Bay Packers fan, so he's got this Brett Favre thing." Spacewalker Mike Fossum also took items for his boys. "My second son John is 17, and he's finishing up his [Boy Scouts'] Eagle and I brought up on my first flight his Eagle badge but [on this flight, I have his] pin that will be pinned onto him during his Eagle ceremony. I flew my older son's [pin] on my first flight, he's already earned his. This time I am flying him a larger Eagle patch that he can have made properly framed and display in his office some day," said Fossum, who serves as a Scoutmaster of a Houston local Boy Scouts troop. Greg Chamitoff, who joined the ISS's Expedition 17 crew after docking, is the second crewmen of Jewish descent to live aboard the station (the first, Garrett Reisman, will return to Earth with Discovery). He brought with him a pair of mezuzot as gifts for a former teacher and a friend. The encased, prayer-inscribed parchment customarily placed on the door frames of Jewish homes were designed by an Israeli artist who was inspired by space exploration. "I will install them [on the door of my sleep area], take pictures and then put them away," said Chamitoff. The PPKs can also include small items for the astronauts themselves. Nyberg brought a few pieces of fabric with her to knit into a quilt after the flight. "My mom taught me to sew when I was six. So I grew sewing, making my own clothes," she said. Beyond their personal kits, the astronauts could also pack items for organizations in their mission's Official Flight Kit (OFK), a larger stash of official presentation items. 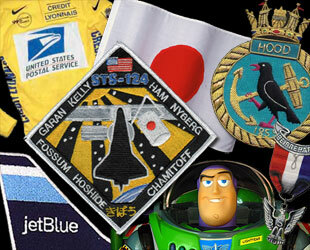 In the STS-124 OFK there is a patch for Jet Blue Airlines; World Series pins for both the White Sox and Astros teams; and ocean water for the U.S. Merchant Marine Booster Club in Kings Point, NY. Ham has a microphone stand for ESPN. Spacewalker Ron Garan has a silver coin for the Manna Energy Foundation, which he founded to combat poverty. Fossum flew a flag for his alma mater, Texas A&M University, continuing his display of Aggie pride that he started during his first flight. Nyberg, as the University of North Dakota's first alumna to fly in space, took a flag and a certificate for the school, as well as a compact disc. "The School of Engineering has sent a disc that has the names of all the students, faculty and staff since I think 1897, whenever the school started." The mission's primary payload, the Japanese pressurized module, the primary component of the three-part Kibo lab and the longest component to be added to the outpost, is represented on the crew by Japan Aerospace Exploration Agency (JAXA) mission specialist Aki Hoshide. He chose items for several schools in Japan as well as a package of Zelkova Serrata tree seeds for the government of Tokyo. "We are [flying] a Japanese flag, but the Kibo itself is the commemorative item, I think," said Hoshide. The following is the STS-124 Official Flight Kit manifest, as provided by NASA. Inventory numbers that are missing indicate items that were removed prior to launch. Items 22 through 95 are manifested at the request of the STS-124 crewmembers. Items 96 through 101 are manifested at the request of the STS-124 payload customers.